ExercisABILITIES was founded to be a place for the Southeast MN community to have improved access to rehabilitation services. Our highly skilled occupational therapy staff are specialists in treating most community based issues. Our adult occupational therapists will help you regain the skills that you need to navigate through your world and care for yourself in areas such as return to work duties, household tasks, or bathing and grooming. They utilize treatment techniques that not only give you ideas for modifications and adaptation tools, such as splints, for your current situation, but also work to improve your abilities and regain skills and abilities. We will help you regain movement, decrease pain, and achieve overall good health to meet your goals. Please see the Pediatric Rehabilitation Page for details for children. 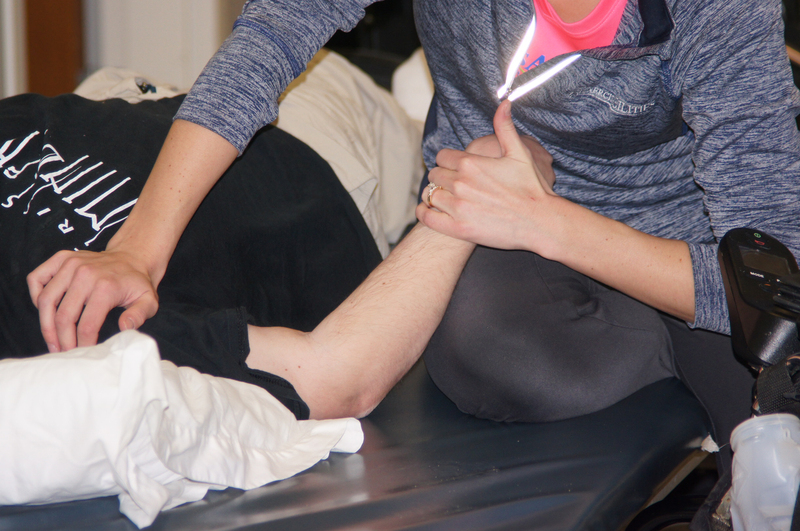 Our occupational therapist, Kimberly Pritchett, OTR specializes in Hand Therapy. Services provided include custom splint-making, prosthetic education and rehabilitation, surgical recovery, manual therapy, neuro-reeducation, pain rehabilitation, and more. Nerve compression injuries such as Carpal Tunnel, Cubital Tunnel, and Radial Tunnel syndromes. Tenosynovitis and Tendonitis issues including Medial and Lateral epicondylitis (Tennis or Golfer’s elbow), Trigger finger, and DeQuervain’s. Call your physician’s office for a referral or request one on your portal. Not all insurances require a referral but we do prefer you start with a referral since most insurances do require this. Call us if you have difficulty getting a referral and we can discuss. MN state laws do not require a provider referral to initiate Occupational therapy. Call us to initiate intake. We will need your demographic information and a photocopy of your insurance card. You can print and fax or drop by the intake form. Bring us any pertinent information that will be helpful for us to know. Bring a list of your prescription medications. Arrive 30 minutes prior to your start time. We have pre-evaluation paperwork for you to complete. How much will Occupational therapy cost? Our business office will research your coverage and notify you of your responsibility prior to your evaluation. Co-pays and Deductibles will be collected at time of service. All insurance covered is dependent on qualifications for skilled need for care. Your occupational therapist can discuss this with you. Medical provider and non medical case manager referral forms, along with new client intake forms can be found on our resource page.